Proform knows cams and offers a variety of precision fixtures and tools to properly diagnose any "mystery" cam issues you may be experiencing. Cam Lobe Checking Fixture - This tool allows you to accurately measure cam lift without fumbling with a magnetic base and a dial indicator. The fixture bolts to deck surface of the block with the supplied 1/2 in. and 7/16 in. adapters hold and maintain the location of the dial indicator with 5 in. extension at the precise angle over the lifters, assuring proper geometry. ''Heads-On'' Cam Checking Fixture w/ Dial Indicator - No more fumbling with a magnetic base and a dial indicator to measure cam lift. This fixture attaches to a 1/4'' - 20 thread valve cover bolt hole and holds the dial indicator in the precisely correct position over the rocker arm or valve retainer, assuring proper geometry. Includes 0-1.000'' dial indicator. Cam Lobe Checking Tools - These easy-to-use tools simply slide down into the lifter bore and sits atop the camshaft for accurate measurement of lobe lift and base circle run out. 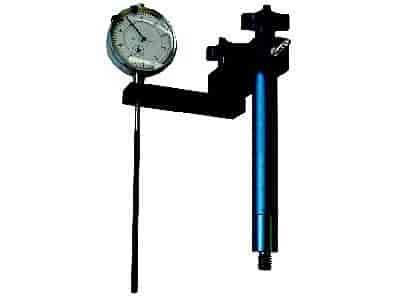 The universal version features an expanding collar to securely fit into any lifter bore measuring .750'' to 1.050''. The GM/Ford version is reversible with O-rings for secure positioning in either GM .842'' diameter or Ford .875'' diameter lifter bores. Both tools include two followers: one for flat tappet and one for roller cams.